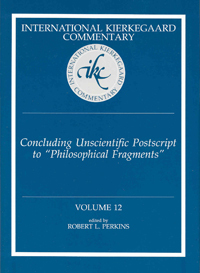 Concluding Unscientific Postscript was published 28 February 1846, and this collection of essays, all written for the sesquicentennial, is offered in celebration of that singular event in the history of philosophy. Not since Hume’s Treatise has a philosophic work of such singular merit fallen so near stillborn from the press. Hume attempted to be his own publicist and recast his revolutionary new arguments in his Inquiries and the Abstract. Kierkegaard, by contrast, made the best of the silence, doggedly pursuing his philosophic task, at least as he Socratically understood it: “once again to read through solo, if possible in a more inward way, the original text handed down from the fathers” (CUP 1:629-30). Philosophical Fragments and Concluding Unscientific Postscript are the two works Kierkegaard published under the pseudonym Johannes Climacus. Taken together as the collected works of John the Climber, they constitute the most contentious contribution to the philosophy of religion in the nineteenth century. Although Climacus responds positively to much of the modernist philosophic enterprise, his originality and perennial importance lie in the fact that his effort more critically and decisively than any other major treatment from that age undercuts key features of the modernist project in the philosophical approach to religion. Both Marx and Nietzsche may be thought to offer more radical treatments of the modern philosophy of religion, but both are more deeply involved with and committed to the common assumptions of the modern age than Climacus: Marx grants priority to materialist considerations in configuring the human telos, and his confidence in scientific development and historical progress, though critical, is unquestioned; while Nietzsche’s secularism, Darwinism, subjectivism and relativism (perspectivism), and atheism brand him as a rather traditional modernist. By contrast, Climacus’s wrestling with the content of the divine accounts for the continued interest in his thought. Continuing the argument and analyses of a previous volume of IKC dedicated to Philosophical Fragments, this collection of essays focuses on the Postscript and undertakes to examine a number of Climacus’s arguments and views of classical and contemporary issues in philosophy.